The publisher’s blurb for this book summarizes its importance in two short sentences: “You are no longer part of the majority. Your response will shape the future of Christianity in America.” This appraisal accurately reflects the situation for Christians today in many parts of the Western world. Increasingly viewed as irrelevant at best and extreme at worst, even believers in traditionally “Christian” countries are being marginalized, pressured, and even persecuted as society around them moves further away from Christian values and beliefs. 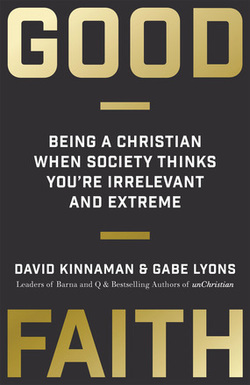 This is the situation carefully analyzed by David Kinnaman, president of the leading research and communications company, Barna Group, and Gabe Lyons, founder of the Christian education and mobilization community “Q.” It is the second collaboration between the two authors and they work well together – producing a seamless and well-written study that deserves your attention. When we see how many people in society reject and even resent any thought of religion, such statistics become frighteningly understandable. As the authors state, Christians have long tried to just be nice as the current trend against Christianity has developed, but it has not helped. Even the most careful balance of conviction and civility cannot help when what one person sees as an expression of faith is seen by another as an expression of folly. As this situation worsens, Christianity is rapidly becoming a minority religion in traditionally Christian countries. But, disturbing as this situation is, there is hope. In Part II of Good Faith, “Living Good Faith,” the authors remind us that “Christianity has managed to survive and thrive as a minority religion countless times throughout history — and does so in many places around the world today.” We just have to handle the situation well if we are to slow the trend and eventually reverse it. These three factors clearly interlock with biblical love and faith, and even, to some extent, hope (“confidence that faith matters”), but the authors’ plan is no simple homily on the Pauline triad. Kinnaman and Lyons provide inspiring, yet practical approaches to improving how well we love, believe, and live in ways that can have a true impact on the lives of others as well as in our own lives. Some of the suggestions Good Faith makes are basic, but others have profound possibilities and all are worth employing as tools for personal growth and societal interaction – in ways which are neither irrelevant nor extreme. In saying this, the authors touch on a central part of the origin of the problem they so ably describe in the book’s first chapters. It is no coincidence that the individuals who comprise society move further from the way of Christianity as they move endlessly closer toward love and fascination with themselves. Good Faith shows some of the ways we can help lead them, and ourselves, back.